I wish I could catch a train out of town to get away from this review, but I already bought the ticket, and it’s non-transferable. I might as well enjoy the ride as best I can, right dear readers? Train are an American rock band which formed in 1993 and continues to dabbles in roots rock, pop rock, and alternative music on occasion. They are what I would describe as “feel good” rock and roll OR if we’re relying on the opinions of those much older and wiser than I, easy listening. As the mothers and fathers that birthed my generation like to call it. Now before I say anything else, you’d be hard pressed not to at least enjoy their music on occasion. They are hugely influenced by acts like Led Zeppelin and Journey, I mean they DID produce a cover album of Led Zeppelin II a while back, in fact. I mention this because Led Zeppelin are what many would call a GOOD band, while Journey are classified as a FUN band. 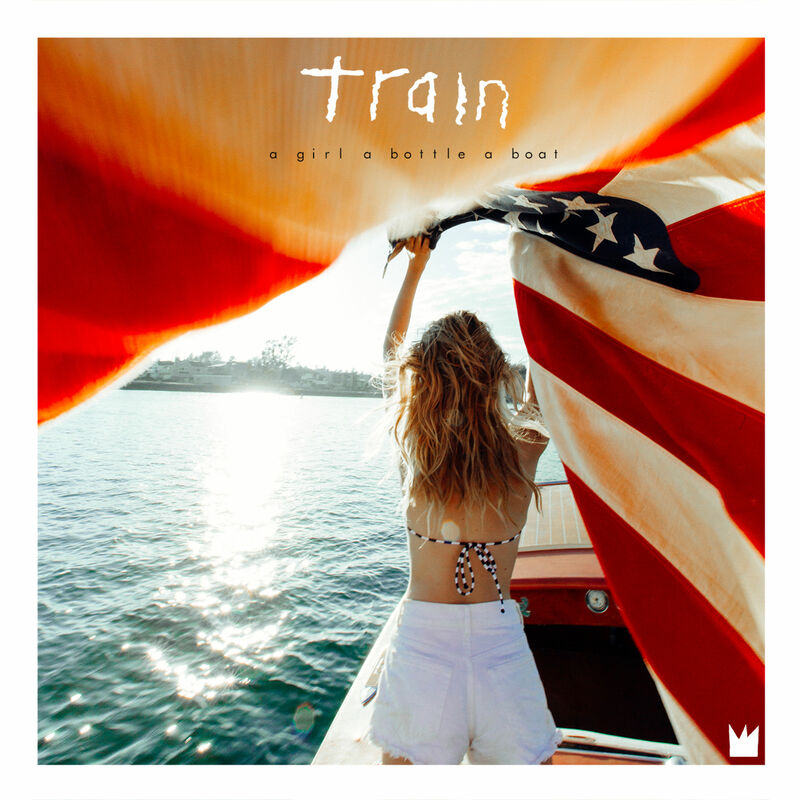 Lovers of catchy hooks, finely polished production and non-stop energy, Train is more than capable of getting a crowd of people grooving and moving to their music. I know this because I saw them perform the majority of Save Me, San Francisco back in 2010 when they were touring that sixth studio length album. But that was quite a while ago – and now we’re looking at A Girl, a Bottle, a Boat. Which happens to be the tenth album these chaps have put out. Drink Up is the album opener and definitely a feel good anthem to spin at the bar or when out on a Friday night. The word catchy comes to mind yet again. Play That Song is track no. 2 and I can see how it would likely be considered as a single of the album, but it’s pretty boring to listen to – not one of the highlights in my opinion. The News is waaaaay more interesting and fun to listen to, and the auto-tune doesn’t feel out of place at all for this mix of sounds. Kinda reminds me of Maroon 5, if Maroon 5 needed to sub-in another band for a concert they were putting on. Then we get to Lottery, which is yet another miss. Trying to marry two kinds of sounds together to no effect. It almost feels like we’re watching a sequence of Star Trek movies back to back, if they were songs. Guess how Working Girl holds up? Pretty well. Surprise, surprise right? Inspired by more 1980s bands then I can count, they are taking some notes from Canadian act Arkells and doing well for it. This is should be the lead single, no questions. Followed by Silver Dollar, which is also sonically pleasing, and then doo wop stinker Valentine, Train is incredibly inconsistent on this record, instead choosing to play towards safety nets of sounds and comfortable themes. What Good Is Saturday is an exercise in self gratification and Loverman is even worse. Lost and Found should be the song I hate, but it’s an obvious self-reflective nostalgia trip and so it’s way less irritating to listen to, the horns also help. Which leads us to the album closer – You Better Believe. You better believe that I was getting sick of this album when this song rolled around, and then they took it down a notch. Why didn’t they do this in other places too? It would have made the album an enriched experience and showed some range on the part of lead singer Patrick Monahan. What a head scratcher. I can’t even really be mad at them, because they’ve been struggling to find relevance for almost a decade. Train is a band that hasn’t been all that interesting since Drops of Jupiter back in 2001, save a bit of a comeback with Save Me, San Francisco in 2009. Which says to me that they are due for a good album next year. Unfortunately this album wasn’t it. It might be a harsher review from me dear readers, but I know that this band has the capacity for good work. I just hope they don’t phone it in next time. Check back in tomorrow for a film review that is just fine.